It’s unbelievable how many “stones” the average person is carrying in his or her Liver and Gallbladder system. 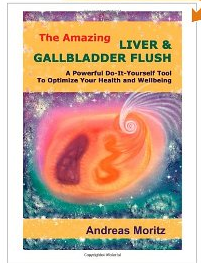 I personally tried on myself a powerful, all-natural livel and gallbladder flush taken from a great book, called “The Amazing Liver and Gallbladder Flush” by Andreas Moritz and the results were absolutely incredible. This book has a full chapter on how to execute the cleanse properly with all natural produts like apple juice, olive oil, lime or lemon juice and epsom salt. Despite I’m living a very healty lifestyle, and I’ve been vegetarian for more than 12 years, (but in the beginning I have to admit, I was a junk food vegetarian : ) I was amazed to see “my stones” coming out the day after the cleanse. In two different sessions I’ve got about 350 stones, the average size was a grain of rice but there where about 30 the size of a hydrated chickpea or kidney bean! For the full procedure please refer to the book, it is quite easy but there are some important details you don’t want to miss so it’s important in my opinion to read it properly, at least chapter 4, the chapter on the actual practical cleanse. The book also has a chapter on kidney cleanse with erbs and herbal teas. Life is great. Paradise is here and now!